This private charity dinner and auction was held to benefit local charities in Beaune that help the poor. 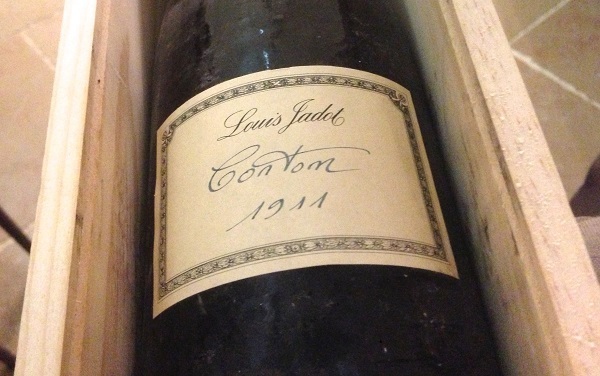 A number of Burgundy’s top growers poured wines from their cellars from magnum as a collection of eye-popping bottles was auctioned off to the attendees. 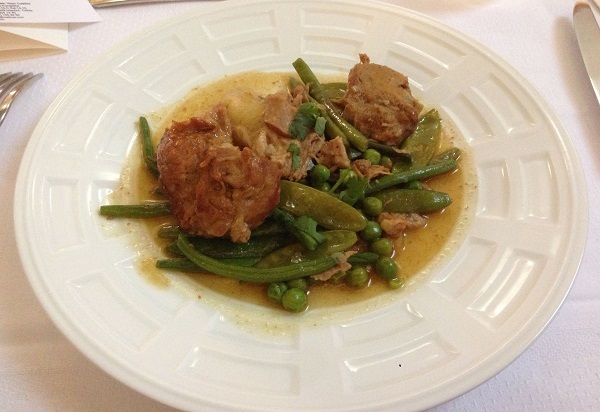 The food was delicious and simple, which allowed the wines to shine even more brightly. Most importantly of all, the auction was a huge success. The evening gave everyone a few hours of much needed escape from the harsh realities of the outside world. Monday June 30 is a day I will never forget. Two days earlier, a violent hailstorm ripped through the vineyards of Burgundy, causing significant damage across a number of villages, most notably Beaune, Pommard, Volnay and Meursault. I spent Monday visiting growers in the Côte de Beaune seeing the damage for myself. By the time dinner came around that day I think everyone was ready for a glass of wine or two. The 2009 Les Climats du Coeur Meursault 1er Cru (magnum) is rich and resonant on the palate, with plenty of the radiance and intensity typical of the year. This large-scaled Meursault appears to be best suited to drinking over the next few years. The Meursault 1er Cru was made by Domaine Roulot and Maison Louis Latour for the Climats du Coeur program. 91/Drinking window: 2014+. Bonneau du Martray’s 2006 Corton-Charlemagne (magnum) opens with a super-classic bouquet of slate, crushed rocks and hints of reduction. Bracing and intense and energetic, the 2006 flows with superb focus and pure mineral-drenched cut. From magnum, the 2006 is simply dazzling and appears to have many years of fine drinking ahead of it. 95/Anticipated maturity: 2014+. Jadot’s 2002 Bâtard-Montrachet (magnum) is a bit of a mystery, as it is very subdued and laid back for the year and site. Almond, honey, hazelnut and apricot nuances meld together in the glass. Still, the 2002 never seems to fully express its customary intensity and volume. 92/Drinking window: 2014-2020. In a vintage in which so many wines are all about intensity, 2009 Marquis d’Angerville’s Volnay Champans (magnum) impresses for its perfume, delineated fruit and fabulous overall balance. Refined and impeccable in its sense of restraint, the 2009 is so very pretty and expressive. Silky tannins round out the racy, polished finish. What a gorgeous wine this is. 94/Drinking window: 2014-2029. A wine of considerable inner tension, the 2008 Liger-Belair Échézeaux (magnum) presents a compelling dynamic of push and pull between all of the elements that are alive in the glass. Floral, savory aromatics meld into a core of intensely perfumed, powerful fruit, all supported by veins of underlying salinity that add cut. A deep, dense, powerful wine, the 2008 Échézeaux is utterly sublime in so many ways. This is another drop-dead gorgeous beauty from Louis-Michel Liger-Belair. 95/Drinking window: 2018-2038. Méo-Camuzet’s 2007 Clos de Vougeot is deep, intense and powerful, with fabulous mid-palate richness and fabulous overall balance. Crushed flowers, licorice and mint add complexity and nuance through to the finish. This is one of the real surprises of the evening. 94/Anticipated maturity: 2014-2034. The 2009 Les Climats du Coeur Gevery-Chambertin 1er Cru is racy, pliant and super-expressive. A classic and highly representative wine for the year, the Gevery-Chambertin captures the pure radiance and generosity of the year. The Gevrey was made by Domaine Dujac and Maison Faiveley. 92/Drinking window: 2014-2024. Faiveley’s 2007 Chambertin Clos de Bèze (magnum) is surprisingly soft, floral and silky, with plenty of high-toned aromatics and sweet red berry fruit, but little of the gravitas that is typical of Bèze. The 2007 offers plenty of near and medium-term appeal. Although not particularly expressive of site, the 2007 Bèze is a pretty wine if taken on its own terms. 92/Drinking window: 2014-2024. The 1999 Comte de Vogüé Bonnes-Mares (magnum) is big and concentrated, with considerable richness and no hard edges, but no real energy, either. 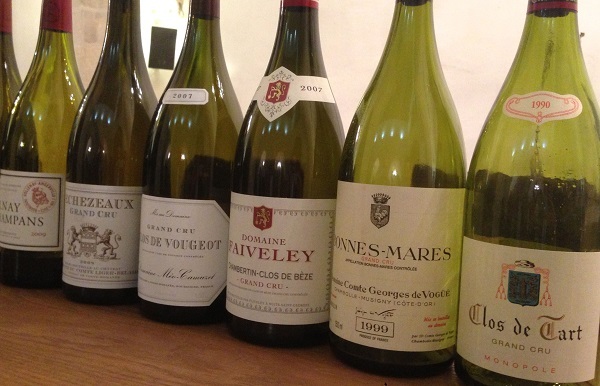 Sadly, the 1999 Bonnes-Mares never fully comes together as the elements remain disjointed. This is an especially dark, heavy Bonnes-Mares with little vibrancy or sense of direction. 90/Drinking window: 2014-2019. Tobacco, earthiness, cedar, mint, dried cherries and crushed flowers all lift from the glass in the 1990 Clos de Tart (magnum). The 1990 is a pretty, if delicate and fleeting, wine from Clos de Tart, but it also shows signs of development in its bouquet that suggest it is best enjoyed within the next few years. 93/Drinking window: 2014-2019. Dujac’s 1996 Clos de La Roche is served last, but its pedigree comes through loud and clear in seemingly endless aromas and flavors that dazzle. Savory herbs, rose petal and soft, supple fruit cress the palate in this gorgeous Burgundy. The 1996 is just entering the early part of its maturity. It should drink well for another decade or two. This is a magnificent showing from the Seysses family. 96/Drinking window: 2014-2026.